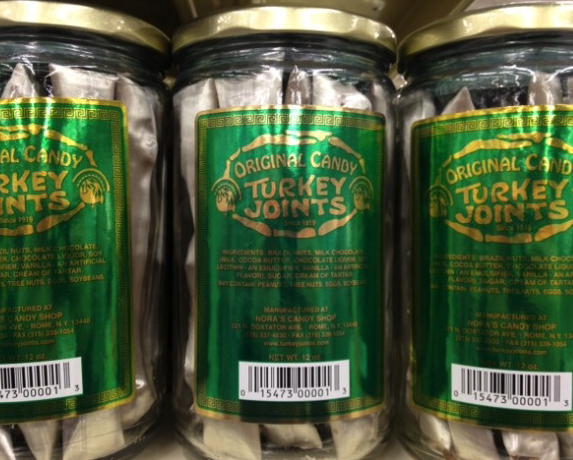 Turkey Joints are a unique, delicious, seasonal candy created in Rome, New York. 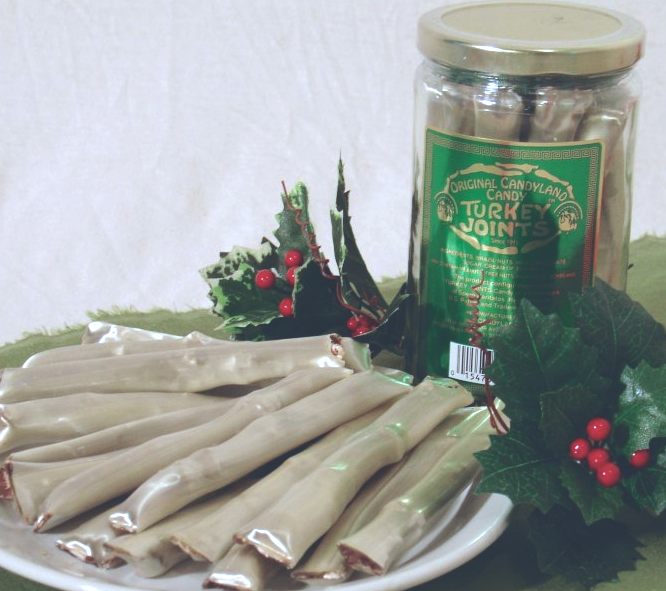 Holidays wouldn’t taste the same without Turkey Joints. And no, they are not made from turkey; they actually have nothing to do with turkeys. 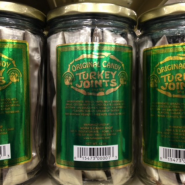 Rome residents don’t make Turkey Joints at home; they buy them at Nora’s Candy shop in person. Nora’s is owned by the Haritatos family, which began making the chocolate treats in 1919, and they’re still made by the same (secret) handmade process. 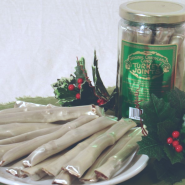 No one knows for sure where the idea for the bone-shaped candies came from, but they’ve been a local Thanksgiving and Christmas tradition for decades. 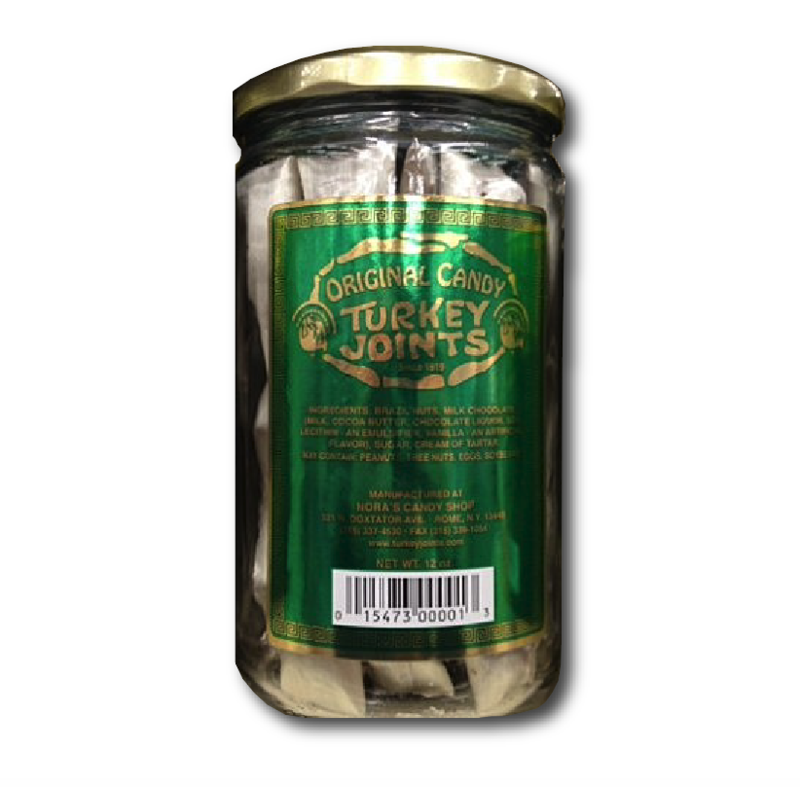 As New York Romans have moved away to other parts of the world, the Turkey Joints tradition has spread. Each year, hundreds of jars are shipped all over the world to homesick Central New Yorkers. Perfect to parties, get togethers, and of course, gifts! The Original Turkey Joints – silvery sugar coating with a center filled with rich chocolate and blend of peanuts and treenuts, including: brazilnuts and hazelnuts. Twelve ounces of confection packed in a jar for a total shipping weight of 2 lbs. ALLERGY ALERT – Please note that this product can contain several types of treenuts.